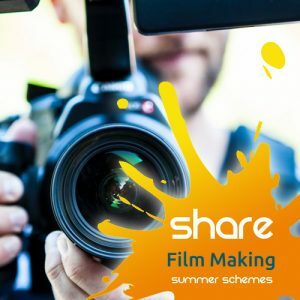 Our ever-popular Summer Schemes are back! 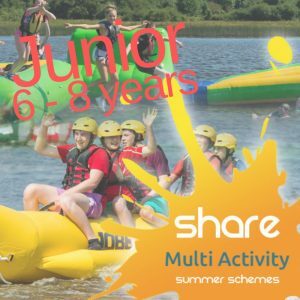 Each week in July and August SHARE is offering a variety of summer schemes for children aged from 6 to 16 years old. 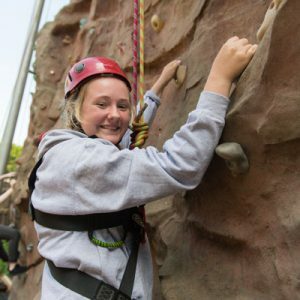 Ensure they have an exciting summer filled with adventure, learning new skills and making new friends, by letting them participate in one of our schemes. All schemes cost £120 per child per week. If booking two or more children, or multiple weeks a discount of £5 is applicable. Schemes run from Monday to Friday, 9:30am to 4:30pm each day. Children should bring a packed lunch. Schemes are limited to 10 participants to each instructor, and full supervision is provided. An action packed week which involves a taste of land, water and arts age appropriate activities! Please contact the office to book your child’s place now, and we advise booking early to avoid disappointment! A booking form and insurance wavier must be completed. 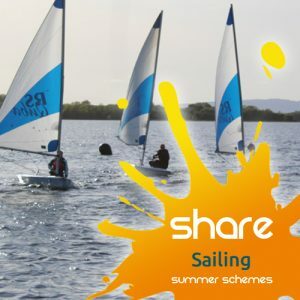 Each week in July and August SHARE is offering a variety of summer schemes for children aged from 10 to 16 years old. Ensure they have an exciting summer filled with adventure, learning new skills and making new friends, by letting them participate in one of our schemes. An adventure week for those who love the great outdoors! 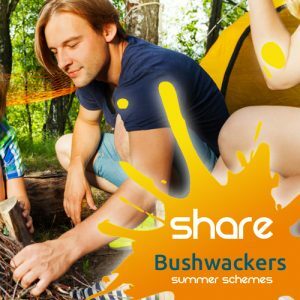 Learn about outdoor survival, bushcraft, shelter building, camping skills, cooking outside and much more! Our Hoppy Easter event this year is on The Inishcruiser! Enjoy Easter entertainment including balloon modelling, face painting and much more, and light refreshments whilst cruising around the many islands of Upper Lough Erne. The event is perfect for all the family, including younger children and will have an Easter theme. Fancy Dress and best behavior is encouraged as the Easter Bunny will be keeping a close eye on all Easter Activities! BOOKING ESSENTIAL!! There is a limited number of places on each cruise, therefore this event MUST BE PRE-BOOKED! These are skill schemes, either develop a new skill from scratch or let our highly qualified instructor improve your ability. 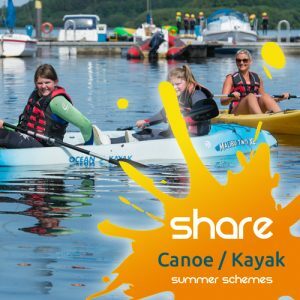 During the week participants will get the chance to try a wide range of boats and work towards their BCU Paddle passport! These are skill schemes, either develop a new skill from scratch or let our highly qualified instructor improve your ability. 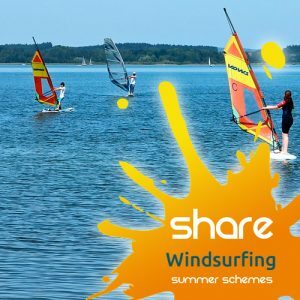 During this week participants will work towards their RYA Windsurfing levels. And the Oscar goes to… YOU! Using our state-of-the-art technology and green screen studio, direct, produce and act in a movie and learn digital techniques. An action packed week which involves a taste of land, water and arts activities! 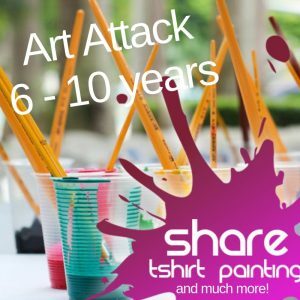 Enjoy a week of discovering different art styles and creating a number of bespoke and group art pieces. Including t-shirt printing, mod roc, mosaics and film making. 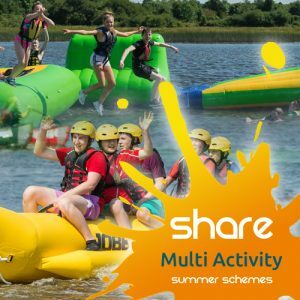 Each week in July and August SHARE is offering a variety of summer schemes for children aged from 8 to 16 years old. Ensure they have an exciting summer filled with adventure, learning new skills and making new friends, by letting them participate in one of our schemes. These are skill schemes, either develop a new skill from scratch or let our highly qualified instructor improve your ability. Work towards your RYA Sailing levels. For only £18 per person you can come and experience beautiful Upper Lough Erne whilst indulging in a traditional afternoon tea spread. 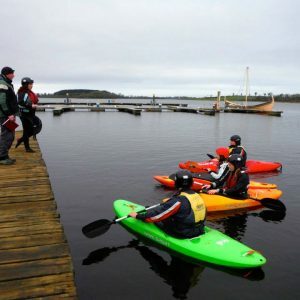 This fully guided tour of Upper Lough Erne is the most relaxing and indulgent way to experience the lake. 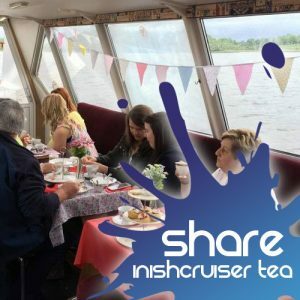 The Inishcruiser is a fully heated, licensed pleasure cruiser, with a viewing platform and room to up to 57 guests, it is the perfect way to experience Lough Erne. This cruise departs at 2:30pm from the SHARE Discovery Village marina and must be pre-booked! 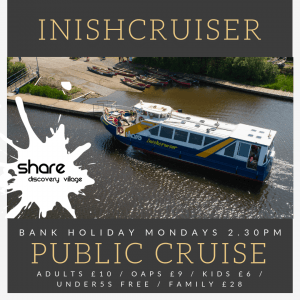 The Inishcruiser is available to the general public every Bank Holiday between Easter and the end of August. 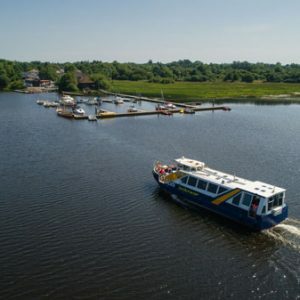 This fully guided cruise lasts 1 ½ – 2 hours and meanders it’s way through the intricate islands of Upper Lough Erne. You will learn about the historic island community from Trannish Island, the Hara Krishna Community who live on Inish Rath, see the ancient Irish woodland at Reilly Wood, and view the plantation castle ruin and picturesque Creighton Tower on Gad Island at Crom Estate. You will also experience a wide variety of wildlife; deer, swans, Canadian geese etc. all of which we regularly encounter on our cruises. Each cruise departs at 2:30pm from SHARE marina, and all customers are asked to report to SHARE reception at least 15minutes before cruise departure time.